The antiserum was produced against synthesized phosphopeptide derived from human IRS-1 around the phosphorylation site of serine 639 (P-K-Sp-V-S). Immunohistochemistry on Paraffin Sections: 1/50~1/100. Insulin receptor substrates (IRS) are responsible for several insulin related activities, such as glucose homeostasis, cell growth, cell transformation, apoptosis and insulin signal transduction. Serine/threonine phosphorylation of IRS1 has been demonstrated to be a negative regulator of insulin signaling and is responsible for its degradation, although IRS1 degradation pathways are not well understood. 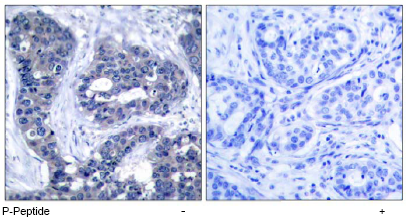 IRS1 has also been shown to be constitutively activated in cancers such as breast cancer, Wilm's tumors, and adrenal cortical carcinomas, thus making IRS1 phosphorylation and subsequent degradation an attractive therapeutic target. To date there have been four subtypes identified: IRS1, 2, 3 and 4, with IRS1 being widely expressed. Affinity Chromatography using epitope-specific phosphopeptide. 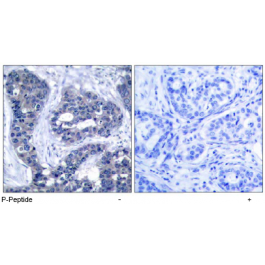 The antibody against non-phosphopeptide was removed by chromatography using non-phosphopeptide corresponding to the phosphorylation site. BPS (without Mg2+ and Ca2+), pH 7.4 containing 150mM NaCl, 0.02% Sodium Azide and 50% Glycerol. 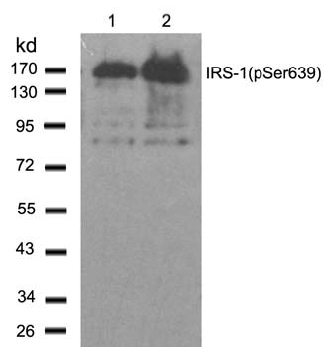 This antibody detects endogenous levels of IRS-1 only when phosphorylated at Serine 639.